Having viewed and reviewed a number of Fassbinder’s films (he made over 40, despite only living to 37) I have been longing to see his third foray into television (the other two being ‘Eight Hours Don’t Make a Day’ in 1972 and the shorter ‘World on a Wire’ a year later). ‘Berlin Alexanderplatz’ was a moderately well-funded television mini-series, shot on 16mm and released in 1980. Based on the 1929 novel by Alfred Döblin, it was fairly epic in scope, running for a total of nearly 16 hours, and sometimes described as '…the worlds’ longest film’; understandably, as it certainly plays out like one. Interestingly, unlike many of Fassbinder’s films, which can be challenging in terms of pace, he seems to have conformed to a more acceptable and populist format here as, whilst it’s certainly not fast-moving by today’s standards, it is by his, whilst retaining many of the qualities that have become associated with the director. So on the surface, it’s a straight-forward drama, but it also digs more deeply into social and psychological questions which are very typical of Fassbinder himself. This Blu-Ray edition is very welcome as it shows the 16mm film in its intended grading. However, make no mistake; this is 16mm (as was typical for much television of the day if not shot in video) and not 35mm, so it’s never going to deliver the full potential of the medium. Apparently, on the film’s original airing, due to the almost sepia, low contrast cinematography (reflecting the mood of the great depression in 1920s Germany) it was almost unwatchable on television at the time, looking decidedly murky and many critics dismissed it pretty much on that basis alone. There is no such problem with this edition which is crystal clear (albeit with soft tones and evident film grain). In 2005, the German Cultural Institute, having completed the reconstruction and restoration of Sergei Eisenstein's Battleship Potemkin, decided to restore Berlin Alexanderplatz, saying that the original 16mm film negative was in "catastrophic physical condition" and that it "must be restored." The restoration was completed in early 2007, exactly 25 years after Fassbinder's death. This is the version that was used for the US Criterion release and it is this edition that is included here, now up-scaled for Blu-Ray. The film starts with a man (Franz Biberkopf played superbly by Gunther Lamprecht) leaving a Berlin prison for the first time in four years, having been incarcerated for manslaughter, beating his former girlfriend with in unwitting fatal blow. He struggles to leave the prison for fear of what he might meet outside. He looks barely sane, decidedly vulnerable and completely unprepared. It’s late 1920s Wiemar Republic Germany, now in the midst of an unstoppable depression after the devastating failure of World War I. Berlin is full of drunks, prostitutes and crooks – not great for Franz as he is determined to go straight. Franz is a complex oaf of a man with a seemingly simple world-view, though is deeply scarred by previous occurrences in his life. Following his release, and after a disastrous liaison with a prostitute, he goes to the apartment of his dead girlfriend’s sister and rapes her, seeing in his mind the reincarnation of his lost love. He is seemingly unrepentant but knows that he must behave better if he is to avoid going back to prison. Before long, it’s clear that Franz is becoming increasingly unhinged – possibly schizophrenic. But he is determined to make a go of things. He tries his hand as a street-trader, selling newspapers and shoe-laces but nothing seems to work. He consistently takes up with the wrong women (for him anyway) and the wrong people. Perhaps the worst of these, is Reinhold, played by Gottfried John who appears in episode 5 and then proceeds to dominate Franz, guiding him effortlessly towards his inevitable ruin. Outside, the back-drop is equally grim with Nazis battling communists for control, gangsters ruling the roost and the general air of fear-infested misery and deprivation. After losing an arm after being hurled out the back of a van, Franz’s prospects take a sudden turn for the worst. That, coupled with the murder of the love of his life, another prostitute, makes the series relentlessly depressing, though it’s done so artfully and with astonishing realism from the cast, that you cannot help but get drawn in. The self-penned epilogue from Fassbinder, a departure from the novel, is two hours of some of the most surreal television this side of ‘The Prisoner’ and ‘The Singing Detective’ which features Franz, accompanied by two ‘angels’ in blonde wigs and suspenders, revisiting all those he has known throughout his sorry and tragic existence. Second Sight have really pulled out the stops on this set with a raft of contextual extras, taking up an entire Blu-ray disc of their own. Fassbinder: Love Without Demands – A highly acclaimed feature-length documentary from 2015 by Christian Braad Thomsen. This provides fascinating insight into a somewhat erratic, implacable Director who produced some 40 films in just over a decade, with varying degrees of critical success. That he was a raw talent, often uncompromising and singular in his outsider viewpoint, is undeniable. Absolutely fascinating and well worth a watch. An appreciation by writer and critic Tony Rayns Rayns – a detailed and slightly academic review of the series and its original impact in the UK way back in the early 1980s. Berlin Alexanderplatz – A Visual Essay by Daniel Bird – I really like these ‘visual essays’, something of a feature these days. David Cairns is an absolute master at these; a veritable film degree course in one, though Daniel Bird gives him a fair academic run for his money here. Some unique insight here too. A Mega Movie and its Story – a 65 minute 2007 documentary by Juliane Lorenz which includes several interviews with the cast. Pretty standard approach but a worthwhile watch, not least to hear from the cast and crew. The Restoration – a brief documentary that does what it says on the tin, outlining the fastidious process of cleaning up some 16mm damaged prints, transferring them to 35mm and re-mastering and re-grading to digital format. 60-page perfect bound booklet featuring new essay by Cahiers Du Cinema’s Stephane du Mesnildot and archive material by Wim Wenders, Thomas Elsasser and Christian Braad Thomsen. I haven’t seen this as not provided as part of the review set, but it sounds excellent. 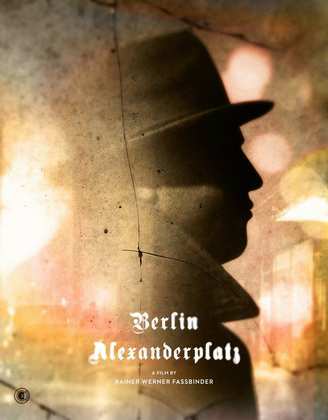 ‘Berlin Alexanderplatz’ is, by any yardstick, an impressive piece of work. It’s sometimes challenging, frequently perplexing and relentlessly depressing. But it is also one of the most rewarding television series I have seen in some time, perhaps because for many Fassbinder fans it is actually more like a ‘long movie’ – the way mini-series often are. This edition is superb, offering a far better experience than its original airing when televisions weren’t yet digital, and its low contrast, almost sepia look was all but lost. There is also an impressive array of extra features, leaving no stone unturned in critically evaluating the series. Highly recommended.